Our Items For Sale. Our site is not yet setup for eCommerce so Please email me and I will send you a PayPal invoice. give me a couple days to respond to your request. Thanks! 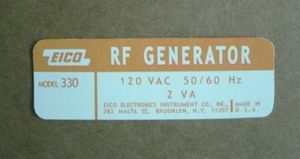 This is a nice reproduction decal for the EICO 330. Price is $5.50 (USD) and includes United States shipping only. Outside the U.S please email for a shipping quote. 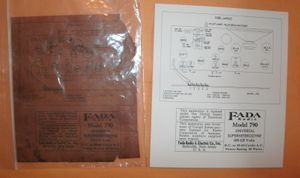 This is a reproduction FADA model 790 Radio bottom label. Shown side by side with an old original so you can see how well it is made. These are NOT photo copies but professionally reproduced labels to finish that restoration project. Price is $7.50 (USD) which includes United States shipping only. Outside the U.S please email for a shipping quote. These are NEW old stock Western Union 12SG7 tubes. Each tube will be tested before shipping. Each tube cost $5.00 each plus shipping. Email for an invoice.